How to drive more customers to restaurant with Pokemon GO? Gaming Cult Pokémon GO: How to get in the spirit and create fortune for Restaurant Business? Sounds familiar? Yes, we are talking about Pokémons. Those little Pocket Monsters that remind you of childhood nostalgia and Game Boy. Cheers! with Pokémon GO they are back. But you are a restaurateur now – a grown-up – who got over that craze long back. Hang on, we are talking about just business here! Yes, people going crazy over it, can turn into an opportunity for you to make fortune. Just released on July 6, the free-to-play game has taken the world by storm and is getting viral like anything. The new Augmented Reality mobile app is dramatically carrying forward the 20 years celebrated legacy of Pokémons while hitting up crescendo. Now you are thinking, as a restaurant owner what you have got to do with Pokemons? And it could be a golden opportunity to network with potential customers aka Pokemon GO players. Even if you are not playing it you can cash in the craze. The best thing is, gamers and non-gamers are equally maniac. 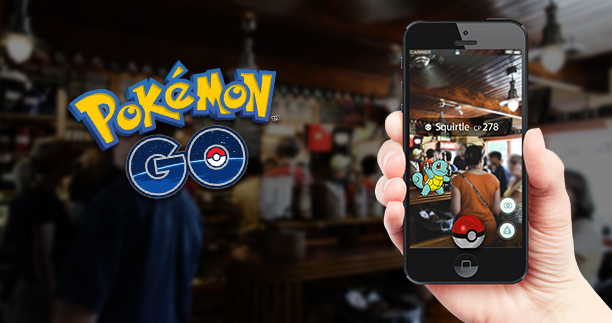 Now, imagine if there is a PokeStop (an in-game location to collect items) at your restaurant. Then, your place could be invaded by those enthusiastic Pokemon chasers. Basically, the game uses phone camera and GPS for the player to move around and turns the surroundings into a Pokemon hunting world. This location-based game makes the real person travel in the virtual world of Pokémons to capture them. While Pokémons in the app are found anywhere and everywhere, it requires quite a long walk to catch them. As long as they are traversing the city capturing the elusive Pokémons (as they clear level after levels! ), it is strongly possible that they might land up at your property looking for a one. When a bunch of people are standing outside your restaurant, with their smartphones in hands, this is how you greet them! First and foremost, you should join the league and learn to talk the Pokémon talk. Find out whether your restaurant is a PokeStop ? If not, explore all the PokeStops in and around your area, to locate the traffic of Pokémon spotters.If your property falls in short radius from a location, then the likelihood strikingly increases that you would find Pokémon GO players around you. Identify and connect with the people in your region who are most likely to be playing Pokémon GO. These Pokémon aficionados are your potential customers. Train and prepare your staff with Pokémon GO, stay consistently updated on gamers and gaming trends/techniques in your region. Set proper guidelines for players and playtimes. Because out of the blue, people wandering around the property premises would be no lesser unsolicited, right? Be smart with offers and discounts. This is where you can innovate. Special offers would certainly attract a pack of passionate Pokémon GO players to visit your place. There is an in-game purchasable object called Pokémon “Lure”. If you are near a PokéStop, you should consider setting up a Lure module at your place. These module stay active for a 30 minutes and attract virtual Pokémons and thereby real Pokémon chasers in the vicinity. For few dollars a day, you can entice the influx of Pokémon hunters drawn to the ‘Lure’. More visitors could result to uptick in sales. Light-bulb moment? Flaunt the Lure modules and tell them when they can find more Pokémons at your place. Know their stories of Pokémon chase and capture, find different ways to share them with mass audience. Many restaurants have already been implementing numerous practices to tempt gamers and have reported significant rise in sales. As much as the game makes the player walk around draining their energy, the app can use the entire battery charge within just a few hours. Just think, at that time if you are offering battery charging portals at your place, gamers would definitely stream in to get charged again. Now it’s your turn to charm them with your hospitality and make them return. When a player shares a photo of a Pokémon captured at your restaurant, re-sharing them could get you rise in audience engagement. Roll out offers and perks for those who use your hashtags on social platforms. How about an online contest then? Do think about it. Produce an inventive Pokémon-special dish or a drink. On top of that, how the gamers would find new Pokémons in and around your place? Well, you spill the beans. Increase patronage. Simultaneously, do not forget about privacy of your current guests. Ensure they get enough space and can keep away from Pokémon noise. Just a little study of what appeals millennial guests, and your mind will come up with hundreds of ideas as to attract them. At the end of the day, what matters for restaurateurs and hoteliers is to just implement some practices to come in terms with modern-day customers. Refraining from what is ‘in’, would only slow your pace down. Multitude of trends will come and go, but what will remain is your brand. Hence, strive to leave impression on your guests, try to grab their attention by bringing in what appeals to them and get them talking about you. Lastly, Pokémons and alike trends are just a means of getting millennial customers notice you, the power lies in the skill how you engage with them and build lifelong experience for them to return.